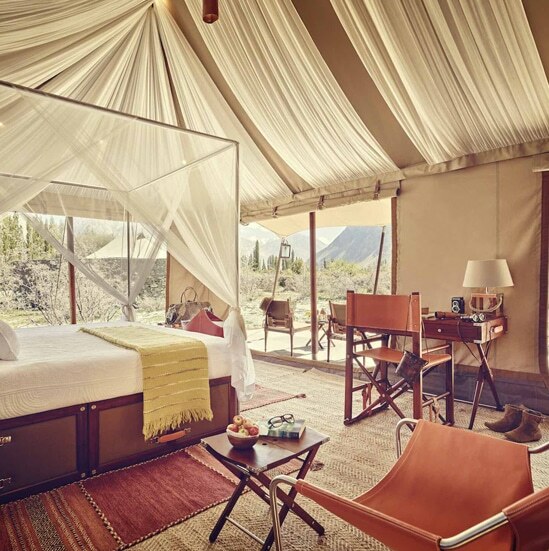 The first truly mobile luxury camps selected by Original Glamping in India covering a calendar of destinations and festivals. This nomadic super luxury camp introduces the discerning traveller to different adventures in carefully selected exceptional locations in the mountains, deserts, jungles and unexplored countryside. Experience the many moods of exotic India with its dramatic landscapes, rustic and unexplored rural surroundings. The Ultimate Travelling Camp can be customised for special occasions for friends and families – a celebration, a wedding, an anniversary, a 50th birthday. Pitch a tent wherever you choose, and take with you every luxury imaginable! We’ve chosen the best destinations and perfect locations across the country, timed perfectly to coincide with events and festivals of each region, to experience the very best in Glamping, glamorous camping!